Gentlemen of the press, good morning and welcome to the press briefing on Nigerian Army Day Celebration (NADCEL) 2016. This year’s NADCEL promises to be unique albeit low key, it will showcase the Nigerian Army’s commitment as a professionally responsive force in the discharge of its constitutional roles. The Nigerian Army as a force has the constitutional mandate to maintain the country’s territorial integrity. Therefore, a succinct reminiscence on the history of the Nigerian Army is desirable as my point of departure, to aptly illustrate the milestones so far covered by our noble institution. The history of the Nigerian Army could be traced to 1863, when Lieutenant Glover of the Royal Navy organized 18 indigenes of Northern Nigerian into a local force known as the “Glover Hausas”. This local force metamorphosed and eventually became part of a larger body established by Lord Fredrick Lugard in 1889, which was named the West African Frontier Force (WAFF) in 1890. The Nigerian Army has since then undergone several transformations with consequent changes in name and structure which include the Nigerian Regiment, Queen’s Own Nigerian Regiment, and the Nigerian Military Force. At Nigeria’s Independence in 1960, it became known as the Royal Nigerian Army, and finally the “Nigerian Army” in 1963, when Nigeria attained Republican Status. NADCEL is an annual event which was first celebrated on 6th July 1978, in solemn remembrance of that historic first shot on 6thJuly, 1967 which marked the commencement of the country’s 30-month Civil War to keep Nigeria one. It was equally to bring to the knowledge of all Nigerian Army personnel and indeed all Nigerians the fact that the war was an unfortunate tragedy and the reconciliation afterwards should be instrumental to the strengthening of our national unity. Subsequently, the Nigerian Army uses the NADCEL week, which terminates on 6th July every year to reflect on its performances in the previous year, for more effective projections and performance in the following year. This is usually premised on the lessons drawn from the activities of the previous year in pursuant of the NA’s responsibility of maintaining and defending the territorial integrity of Nigeria as well as safeguarding lives and property of its citizenry. This responsibility has become compelling particularly in view of our multifaceted security challenges. 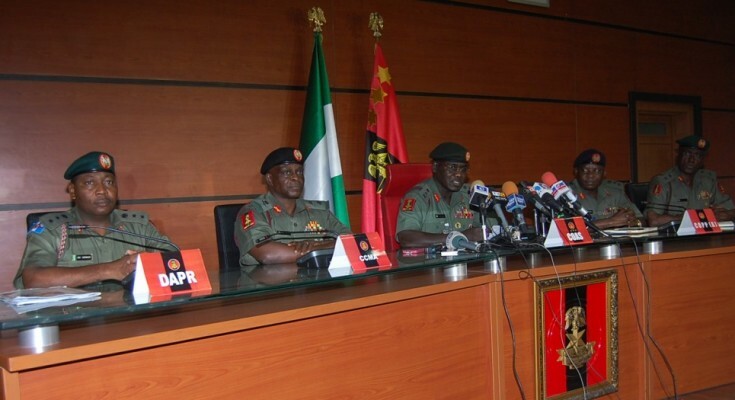 In line with this noble objective, the relocation of the Military Command and Control Centre (MCCC) to the epicentre of the operations theatre for effective prosecution of the ongoing fight against insurgency as directed by President Muhammadu Buhari has been fully complied with. This has provided the Military Command with more theatre visibility, effective command and control, resulting in continual decimation of the remaining insurgents. The NA working in concert with other Services and agencies has firmly reasserted its control over our territory where the insurgents had in the past exercised freedom of action. The theme for this year’s NADCEL which is “Optimizing the Capability of the Nigerian Army to meet Contemporary Security Challenges.” This further emphasises the resoluteness with which the NA is fighting to bring the menace to a complete halt and restore peace and normalcy to the North East as well as other parts of the country. It is also worthy of note that in line with my vision which is “to have a professionally responsive Nigerian Army in the discharge of its constitutional roles,” we have made remarkable achievements within the last one year including human rights awareness. Let me reiterate that the Nigerian Army under my leadership will continue to respect all aspects of human rights as enshrined in the Constitution of the Federal Republic of Nigeria as well as other international principles and guidelines on the subject. This year’s NADCEL is in two phases. The First Phase commenced earlier from 11th to 20th April, 2016 with activities reinforcing the need to shore up fighting capabilities and responsiveness of our troops by injecting into its programme, a Command Post Exercise (CPX). During the exercise Commanders, Headquarters elements and Staff of a Brigade were simulated in a deployment, administration and communications play within and between the exercised elements in Alkaleri Forest, Bauchi State. This will dovetail into the Second Phase from 11 – 14 July, 2016 in which troops of 1 Brigade would be engaged in a Field Training Exercise (FTX) involving realistic and varying war situations in Bakura Forest, Gusau Zamfara State. Permit me to note here, that aside providing ample opportunities for equipment and weapons testing, the exercises would also serve to sharpen the tactical skills of individual officers and soldiers, as well as improve the operational readiness of the formation. It would also serve as deterrent to cattle rustlers, armed bandits and other criminals hibernating in those areas. Other activities lined up to mark the celebration include, Juma’at Prayers in all Nigerian Army formations and units on Friday 1 July, 2016 and will be followed on Saturday 2 July, 2016 by a major Environmental Sanitation Exercise which will be carried out along Abuja–Keffi Road, and in other respective Nigerian Army formations and units in the country. Interdenominational Church Service will also be held in all Nigerian Army formations and units across the nation on Sunday 3 July, 2016 while on Monday 11 July, 2016, I will pay Courtesy Calls on the Executive Governor of Zamfara State and the Emir of Gusau. This year’s NADCEL, will also enable the Nigerian Army reach out to the public through its Medical Outreach Program on Tuesday 12 July, 2016, during which inhabitants of Gusau and other communities in its environs will benefit from free medical diagnosis and treatment. It might interest you to note, that this medical outreach will also take place in all formations of the Nigerian Army concurrently. There will be a Camp Fire to symbolise the end of the FTX. Subsequently, there will be an equipment display at the Old Airport, Gusau during which deserving officers and soldiers will be honoured with COAS Commendation Award. Gentlemen of the press, we have been partners in progress, however, the Nigerian Army still requires more commitment from you in the fight against terrorism. I must urge you therefore to put national interest above any other consideration and to tread the path of honour by not joining any band wagon to report unverified negativities to the detriment of our national peace and security.